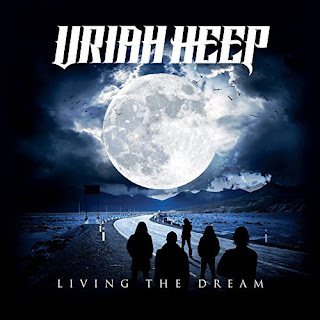 Δελτίο τύπου: «Uriah Heep have released their highly anticipated brand new studio album - the 25th in their storied career - titled, appropriately enough, “Living The Dream”. "We have been together for 47 years and we have seen many bands come and go, so in effect we are 'Still Living The Dream,' so it was the perfect title for the new album," says Uriah Heep guitarist and founding member Mick Box. Famed Canadian engineer, Jay Ruston has been called in to produce the album. Mick continues: "We chose Jay because we admire his work with The Winery Dogs, Stone Sour, Black Star Riders, Paul Gilbert, and Europe. Jay has either produced, mixed orboth for these bands, and he brought a fresh approach to Heep. He has been marvellous to work with. "The band is beyond excited with the material written for the new album, which will include some epic additions to the band's huge catalog of rock staples and looks forward to sharing it with their fans around the world. Uriah Heep debuted in 1970 with the release of one of hard rock's milestones, Very 'eavy... Very 'umble, and have since sold in excess of 30 million albums worldwide. They constantly tour the world, playing up to 125 shows a year to 500,000+ fans. Lyric video: "Knocking At My Door"
ROCK STAR 17 Ιανουαρίου 2019 - 10:55 μ.μ. Από τους καλύτερους περσινούς δίσκους. Τα παππούδια το χουν ακόμη.